Day 12 of the government shutdown and the news cycle has been successfully commandeered by the President’s demands for funding a wall on the Southern border. His defenders say it’s not a real wall, but a metaphor for a secure border. Metaphors abound with this presidency, even if it’s not always clear what they represent. 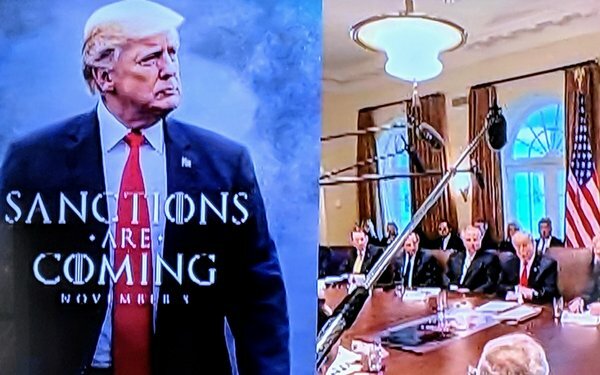 During today’s cabinet meeting, the President sat with a “Game of Thrones”-styled poster in front of him, trumpeting “Sanctions Are Coming -- November 5,” for no apparent reason. It was never referred to in the meeting, which mainly focused on the protracted government shutdown, the need for border wall funding, Senator-elect Mitt Romney’s Washington Post op-ed criticizing the President’s character, and a bizarre litany of quips and sound bites trying to cast the blame on “obstructionist” Democrats. That's despite the fact the President previously held a televised meeting with Democrats saying he would take ownership for the shutdown. Oh, and a shoutout to Kanye West. In other words, the third year of this White House administration started out much the same way as the first two: lots of misdirections intended to distract America from what’s really going on: a dysfunctional presidency. But things are about to get very real starting tomorrow when Democrats assume control of the House — and the ability to shift the narrative back to checks and balances. That was underscored by Vanity Fair’s “The Watchdogs” piece, which was accompanied by a powerful photo of new House of Representatives committee chairs Elijah Cummings, Jerry Nadler, Adam Schiff, Maxine Waters and Richard Neal, who looked like they’re ready for business. 5 comments about "Hitting The Wall". Nina Lentini from MediaPost Communications, January 2, 2019 at 4:21 p.m.
David Scardino from TV & Film Content Development, January 3, 2019 at 1:04 p.m.
"... lots of misdirections intended to distract America from what’s really going on: a dysfunctional presidency." Joe you give our ignoramus president way, way, way too much credit. It's just colossal ignorance at a level we've never seen before in any leader. John Grono from GAP Research, January 3, 2019 at 4:33 p.m.
Maybe a metaphorical $5b for a metaphorical wall could end the shut-down. Metaphorically speaking of course. Joe Mandese from MediaPost, January 3, 2019 at 5:53 p.m.
@John Grono: I'd contribute metaphorical tax dollars toward it. John Grono from GAP Research, January 3, 2019 at 8:55 p.m.
Joe, I'd also like to contribute metaphorical tax dollars. But being an Aussie, I'd probably be confronted by a very large metaphorical wall that would prevent me from doing so.